Preparing to die As many elders approach the end of life, several tasks can help make the last chapter of life rich, full of meaning, reconciliation, and even joy. These include Ira Byock’s famous “four things that matter most:” Thank you, I forgive you, Will you forgive me? and I love you. Some models add a fifth task: Saying goodbye. Embedded in these steps is a great deal of emotional and spiritual work. When engaging in a life review, the aging person may come to see formative themes, critical events, their strengths and mistakes, and their relationships in new ways. The tasks of dying help bring to resolution dynamics of deep feeling. Whether the person expresses these in a one-on-one conversation, in prayer, or if a community celebrates the dying person in a party, the ritual nature of this approach to saying goodbye can be healing. How being an LGBT elder may make such resolution at end of life more challenging Today’s LGBT elders may find the end of life more challenging than do other elders. Various subgroups of LGBT elders are more likely than their non-LGBT peers to suffer from mood disorders, anxiety disorders, eating disorders, substance abuse disorders, and be living with HIV/AIDS. Many do not have the biological family support that others do, and many suffer from lower socioeconomic status, with less access to quality health care and health insurance. 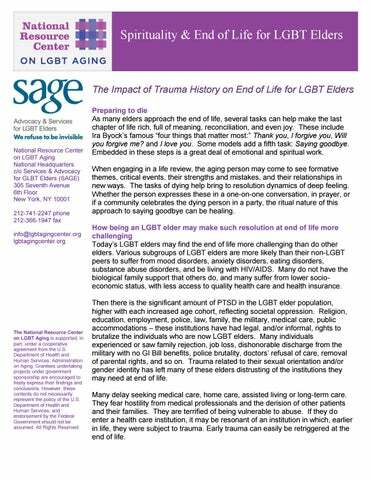 Then there is the significant amount of PTSD in the LGBT elder population, higher with each increased age cohort, reflecting societal oppression. 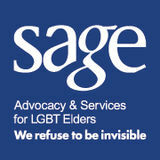 Religion, education, employment, police, law, family, the military, medical care, public accommodations – these institutions have had legal, and/or informal, rights to brutalize the individuals who are now LGBT elders. Many individuals experienced or saw family rejection, job loss, dishonorable discharge from the military with no GI Bill benefits, police brutality, doctors’ refusal of care, removal of parental rights, and so on. Trauma related to their sexual orientation and/or gender identity has left many of these elders distrusting of the institutions they may need at end of life. Many delay seeking medical care, home care, assisted living or long-term care. They fear hostility from medical professionals and the derision of other patients and their families. They are terrified of being vulnerable to abuse. If they do enter a health care institution, it may be resonant of an institution in which, earlier in life, they were subject to trauma. Early trauma can easily be retriggered at the end of life.